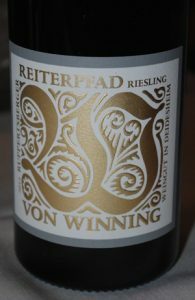 2015 Weingut Von Winning, Riesling Trocken, Ruppertsberger Reiterpfad, Pfalz Germany. the 2015’s from Germany are gorgeous and powerful wines, you are are going to want these for the hedonistic youthful pleasures and for long term cellar aging, this is a vintage to love from day one until even past your own mortal lifetime! From the Mosel, Ahr, Rheingau to the Pfalz and beyond Riesling excelled producing vibrant, concentrated and aromatic wines with loads of extract, mineral intensity and vigorous acidity, it is especially exceptional in regards to dry and medium sweet styles, you might have to search a bit harder for TBA and Eiswein, though a few stickies were made they are not finished fermenting, as some are from grapes picked in mid January! In the case of the Pfalz, Von Winning has made one of the greatest set of dry wines you’ll ever encounter, and while the Grosses Gewachs haven’t even been bottled yet, the cask samples are amazing, something heavenly beyond mere words, one of the stars and in finished bottle was the glorious Reiterpfad Trocken, this is a dry Riesling so good, I even blurted out it was better than Raveneau! I had recent enjoyed a stunning bottle of Raveneau Montee and it was still fresh on my mind, and I can tell you, this Von Winning (Ruppertsberger) Reiterpfad Trocken is right up there with it, this is freakishly good stuff with wonderful steely mineral tones, lush textures and stylish length, it is crystalline, vivid, rich, but crisp and sharply focused. Native yeast, and fermented in cask, the Reiterpfad feels like a Premier Cru Chablis, but with pure Riesling soul and terroir character with lime blossom, tangerine, green apple, quince, lemony marmalade, peach/stone fruit along with sea salt, white tea, briny notes, wet stone and verbena. There’s exotic leesy density, hints of tropical essences that contrast well against the vigor, bright acids and tangy chalkiness in this stunning Riesling. Big thanks to Terry Theise the importer for introducing me to von Winning, and turning me on to their mind-blowing Sauvignon Blancs, and to Andreas Hutwohl of Von Winning’s talented team for showing me his wines and letting me take this Reiterpfad home to study! The brilliant Von Winning 2015’s are without a doubt, along with Donnhoff, Schaefer, Selbach and Loewen, are must haves, do not miss, in particular this fantastic Reiterpfad Trocken.